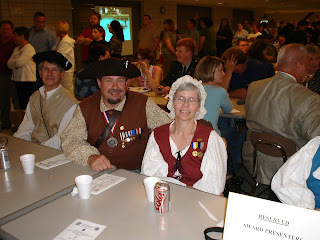 In this photo seated at table is (L-R) Bob Hall (Ruth's husband), John G. West, Becky West, and Peggy Gilkey's elbow is to the far right (in white blouse & blue vest). [Click on photo to get a larger image.] We were there to present the National Society of the Sons of the American Revolution's JROTC Medal, Ribbon & Certificate to an Outstanding Cadet. Representatives of the US Military Branches, DAR, etc. along with SAR present awards to deserving cadets for various achievements. We do the same thing for Evansville Harrison High School.